The world is full of stories about mythical creatures, legendary beasts, and supernatural and god-like beings. For thousands of years, humans everywhere—sometimes inspired by living animals or even fossils—have brought mythic creatures to life in stories, songs, and works of art. Today these creatures, from the powerful dragon to the soaring phoenix, continue to thrill, terrify, entertain, and inspire us. Some, such as the Loch Ness Monster or Sasquatch, continue to be "sighted" and sought to this day. While the origins of these fabulous creatures are varied, and often disputed, they have played significant roles in human society, and have served to stimulate the imagination and desire that is ingrained in human nature to experience more than this physical world. Whether they truly exist in physical form is indeed secondary to their existence in the minds of so many people throughout the world and through history. 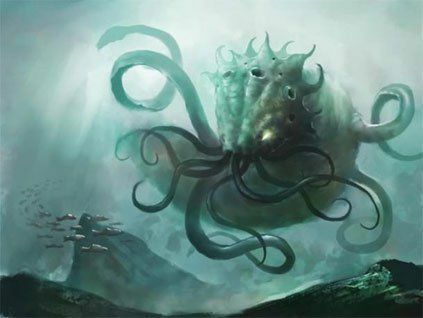 According to the Scandinavian mythology, the Kraken is a giant sea creature (said to be 1 mile long) that attacks ships and is so huge that its body could be mistaken for an island. 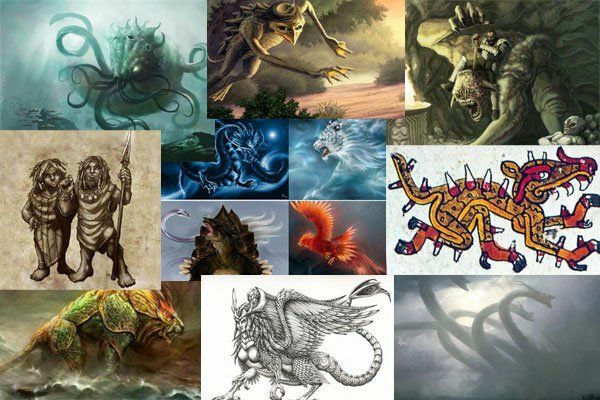 It is first mentioned in the Örvar-Oddr, a 13th century Icelandic saga involving two sea monsters, the Hafgufa (sea mist) and the Lyngbakr (heather-back). The Hafgufa is supposed to be a reference to the Kraken. The existence of the Kraken was even acknowledged in scientific texts, including the first edition of Systema Naturae , a taxonomic classification of living organisms by the Swedish botanist, physician, and zoologist Carolus Linnaeus. He classified the Kraken as a cephalopod, designating the scientific name Microcosmus marinus. Although any mention to Kraken was omitted in later editions of the Systema Naturae, Linnaeus described it in his later work, Fauna Suecica , as a "unique monster" that "is said to inhabit the seas of Norway”. Accounts of the Kraken are believed by many historians to have originated from sightings of the giant squid, which can reach 18 meters in length. 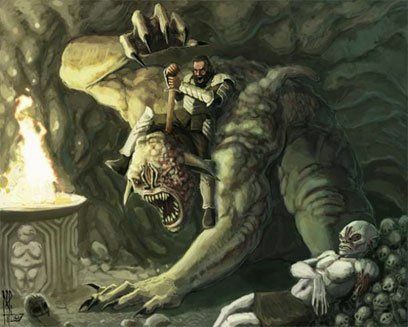 Beowulf is an Old English heroic epic poem set in Scandinavia and cited as one of the most important works of Anglo-Saxon literature of all time. Dated between the 8th and early 11th century, the epic poem tells the story of Beowulf, a great hero who comes to the aid of Hroðgar, the king of the Danes, by defeating a beast known as Grendel who had been terrorising the great mead hall built by Hroðgar and threatening the entire kingdom. Archaeological research has verified that the great hall commissioned by Hroðgar did indeed exist, and was located in the country’s earliest royal capital, Lejre, 23 miles west of modern Copenhagen. Whether Grendel (meaning quite literarily ‘the destroyer’) originally existed in some less legendary form – perhaps symbolizing a malevolent spirit responsible for disease and death, or a particularly fierce-looking human enemy – is as yet unknown. In ancient Japanese folklore, the Kappa is a water demon that inhabits rivers and lakes and devours disobedient little children. 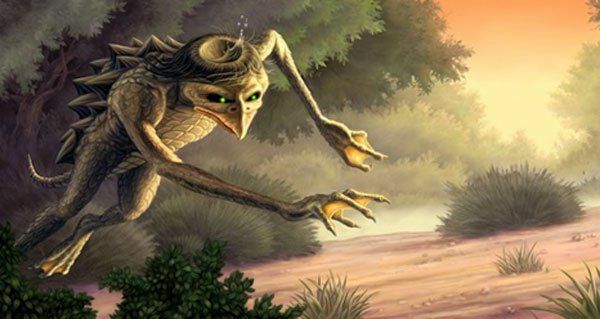 The Kappa, a word meaning ‘river child’, is usually depicted with the body of a tortoise, a beak, and the limbs of a frog, and has a hollow filled with water on top of his head. While they are primarily water creatures, they are believed to occasionally venture onto land. According to legend, the cavity must be kept wet when the Kappa ventures out of the water, or he will lose his powers. The Kappa is one of the most well-known folk legends in Japan and many believe the mythical creature to be true. In fact, there are signs near some lakes in Japan warning people of their presence. However, others maintain it is much more likely that the legend of the Kappa is connected with sightings of the Japanese Giant Salamander, or ‘hanzaki’, which is known to be aggressive and to grab its prey with its powerful jaws. According to tales and legends, the beginning of Chinese New Year started with the fight against a mythical beast called Nian, who had the body of a bull and the head of a lion. It was said to be a ferocious animal that lived in the mountains and hunted for a living. Towards the end of Winter when there was nothing to eat, Nian would come on the first day of New Year to the villages to eat livestock, crops, and even villagers, especially children. To protect themselves, the villagers would put food in front of their doors at the beginning of every year. It was believed that after the Nian ate the food they prepared, it wouldn’t attack any more people. The villagers would live in terror over the winter, but over time they learned that the ferocious Nian was afraid of three things: the colour red, fire, and noise. So when the New Year was about to come, the villagers would hang red lanterns and red spring scrolls on windows and doors. They also used firecrackers to frighten away the Nian. From then on, Nian never came to the village again. According to legend, the Nian was eventually captured by Hongjun Laozu, an ancient Taoist monk, and Nian became Hongjun Laozu's mount. After Nian was captured, everyone had a big celebration and the ritual involved in banishing him was repeated the following year, and so the ritual was passed down from generation to generation and the custom of celebrating New Year with firecrackers, noise, and the colour red has persisted to this day. The naga is a legendary aquatic, serpentine creature that resides in oceans, rivers, lakes, or waterfalls. Nagas are said to have black scales and can grow to hundreds of feet in length. Nagas are traditionally worshipped as personifications of water deities and considered bringers of rain and clouds. They are guardians of temples and holy places. Most Kaliyatran believe that the superior God direct the actions of the nagas, and these sea serpents are honoured with many titles such as the "Maharaja Sarpa" and the "Naga who is God". 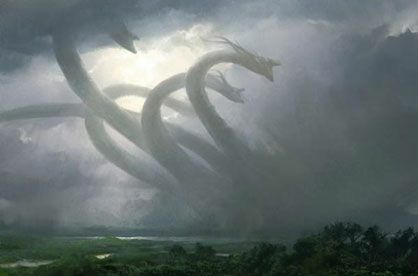 It is commonly believed that nagas live in underground cities, are capable of speech and can use their heavenly powers to control weather and assume humanoid form at will. The legend of the Piasa Bird dates back to long before European explorers came to region. It has been traced to a band of Illiniwek Indians who lived along the Mississippi in the vicinity north of present-day Alton. This tribe, led by a chief named Owatoga, hunted and fished the valley and the river and lived a contented life until the "great beast" came, described by French missionary priest Jacques Marquette in 1673 as follows: “it is as large as a calf, with horns like a roebuck, red eyes, a beard like a tiger and a frightful countenance. 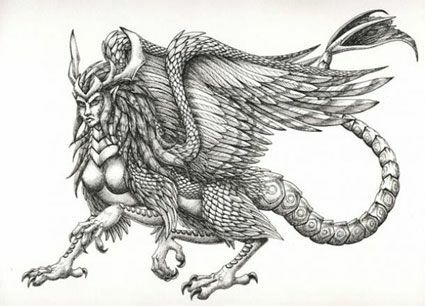 The face was something like that of a man, the body covered in scales, and the tail so long that it passed entirely around the body, over the head and between the legs, ending like a fish.” As with the Illini tribes, there can be found traditions of similar large birds and dragons throughout the world. The Dacotah tribe believed that thunder was a monstrous bird flying through the air and claimed that these birds were large enough to carry off human beings. In the ancient Buddhist caves of India there can be found a number of carved and painted dragons that easily fit with the descriptions of Piasa. Some have questioned whether the so-called mythical creature could have been an ancient species of bird that actually existed. That so many cultures and groups of people separated by thousands of miles and years have similar tales of immense flying creatures is curious to say the least. 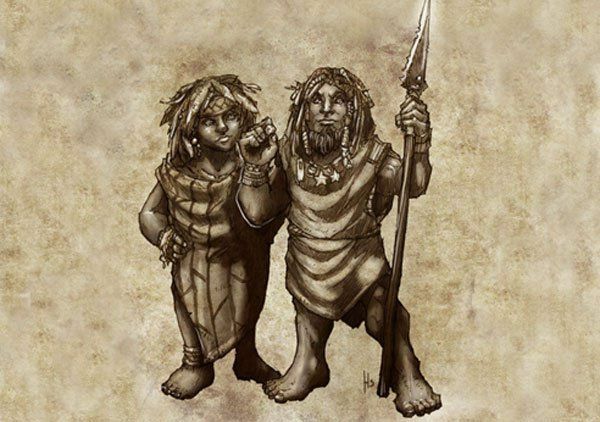 In Hawaiian mythology, the Menehune are said to be an ancient race of people small in stature, who lived in Hawaii before settlers arrived from Polynesia. Many scholars attribute ancient structures found on the Hawaiian Islands to the Menehune. However, others have argued that the legends of the Menehune are a post-European contact mythology and that no such race existed. The mythology of the Menehune is as old as the beginnings of Polynesian history. When the first Polynesians arrived in Hawaii, they found dams, fish-ponds, roads, and even temples, all said to have been built by the Menehune who were superb craftspeople. Some of these structures still exist, and the highly-skilled craftsmanship is evident. According to legend, each Menehune was a master of a certain craft and had one special function they accomplished with great precision and expertise. They would set out at dusk to build something in one night, and if this was not achieved, it would be abandoned. To date, no human skeletal remains of a physically small race of people have ever been found on Kaua’I or on any other Hawaiian islands. While this does not disprove that a race of small people existed, it does draw the truth behind the legend into question. Nevertheless, there is compelling evidence, both archaeological and in the numerous legends passed down over generations, that suggests that there was indeed an ancient race of highly skilled people who inhabited the Hawaiian islands long before the Polynesians arrived. 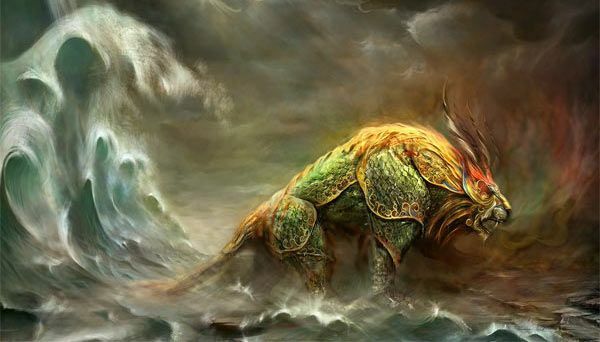 The Aztecs of Mexico held the belief that the Earth was created from the destruction of a large sea demon, created by and known to the gods as Cipactli. 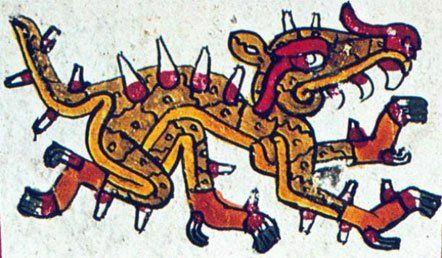 Cipactli was described in many fashions: a crocodile with toad and fish characteristics, a sea demon or monster. Regardless of the description, the Aztecs considered this asexual sea monster the source of the cosmos. Cipactli’s appetite was insatiable, and each joint of the creature bore a mouth. As the gods began the process of creation, they soon realized that their other creations would fall into the void and be devoured by the demon, so they decided to destroy Cipactli. Tezcatlipoca lured the monster in and lost a foot to its insatiable appetite before the gods were able to defeat it. Cipactli put up a fight, but in the end the gods prevailed. They pulled Cipactli’s body in four directions and freed the universe from its body. Then Tezcatlipoca and Quetzalcoatl created the heavens and the Earth and everything therein from Cipactli’s body. The creature’s head became the thirteen heavens, its tail the underworld, its midsection the Earth. The griffin is a legendary creature with the head and wings of an eagle, and the body, tail, and hind legs of a lion. As the eagle was considered the ‘king of the birds’, and the lion the ‘king of the beasts’, the griffin was perceived as a powerful and majestic creature. 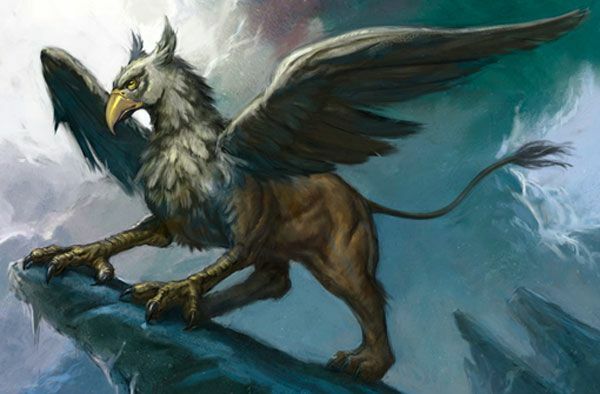 During the Persian Empire, the griffin was seen as a protector from evil, witchcraft, and slander. While griffins are most common in the art and mythology of Ancient Greece, there is evidence of representations of griffins in ancient Persia and ancient Egypt dating back to as early as the 4th millennium BC. On the island of Crete in Greece, archaeologists have uncovered depictions of griffins in frescoes in the ‘Throne Room’ of the Bronze Age Palace of Knossos dating back to the 15th century BC. In ancient Chinese astronomy, the sky ecliptic was divided into four sections. Each of these sections contained seven mansions, and together they formed the 28 Mansions. The 28 Mansions may be considered to be equivalent to the zodiacal constellations in Western astronomy, although they reflect the movement of the Moon through a sidereal month rather than the Sun in a tropical year. This enabled the ancient Chinese to mark the travelling positions of the Sun and the Moon, as well as to determine the time and seasons. Each section of the sky is assigned to a mythological creature, collectively known as the Four Symbols. 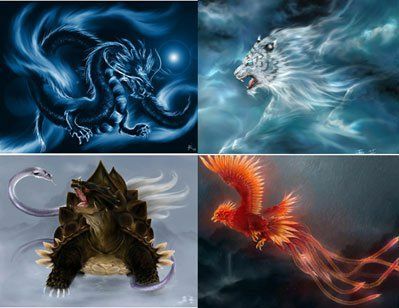 These creatures are the Azure Dragon of the East, the White Tiger of the West, the Black Tortoise of the North, and the Vermillion Bird of the South. Apart from their astronomical significance, each of the Four Symbols is surrounded by various mythological associations.